It's hard to imagine a more photogenic couple than this bride and groom from California who came back to Louisiana to get married. They both work as on-air news reporters, so, not surprisingly, they were completely comfortable in front of the camera! 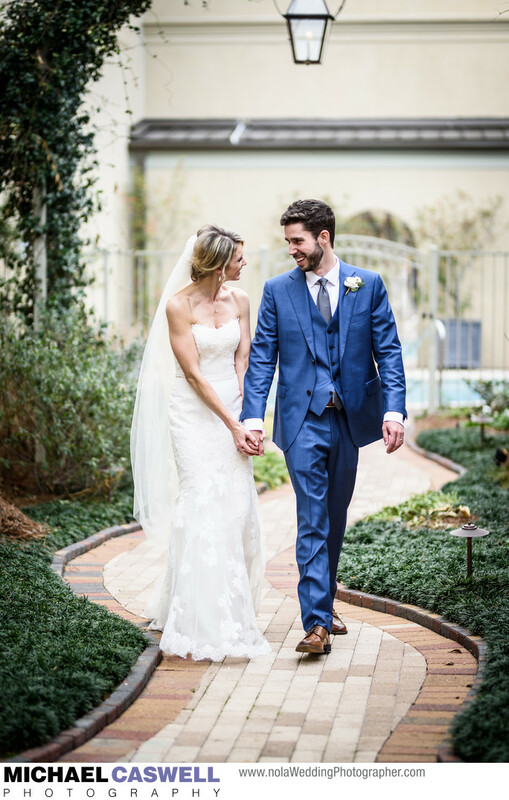 We started out the wedding day at the elegant Southern Hotel in downtown Covington, where the bride and groom and both sides of the wedding party were getting ready in suites on either side of the hotel. Flawless Bride did the girls' makeup and did a fantastic job as usual, with the gorgeous flowers being provided by Villere's Florist. I loved the gifts each gave to the other. The groom's gift to the bride was a DSLR camera kit, which she was thrilled to receive, while the she presented him with a beautiful book she had created out of old letters his late grandfather had written over the years. After the ceremony at Our Lady of the Lake Catholic Church in Mandeville, and some formal group shots, we were on our way back to the Southern Hotel for the wedding reception, where Party-Tyme Productions was on hand for the DJ duties. The bride handled most of the decorating of the venue, while Zoe's Bakery crafted the beautiful wedding cake, as well as the New Orleans Saints groom's cake (though they moved to California, he is originally from this area). 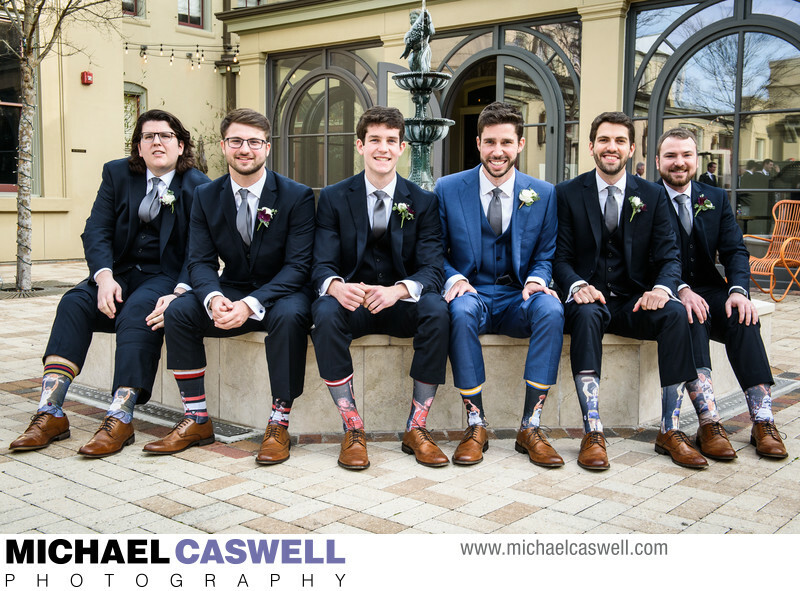 I loved how the couple made some time for a few informal fun shots out in the courtyard of the girls and the guys (with their custom sports-themed socks! ), as well as some portraits of just the two of them around the hotel. The day was wrapped up with some very nice speeches from the maid of honor and best man, as well as from the bride and groom, which were particularly eloquent given both of them being in the business of communication! The wedding took place on a pleasantly mild January afternoon, and I was happy that they specifically devoted some time for portraits of just the two of them. And even better, both being in the news media industry, they had a good grasp on what time of day would be best in terms of light. 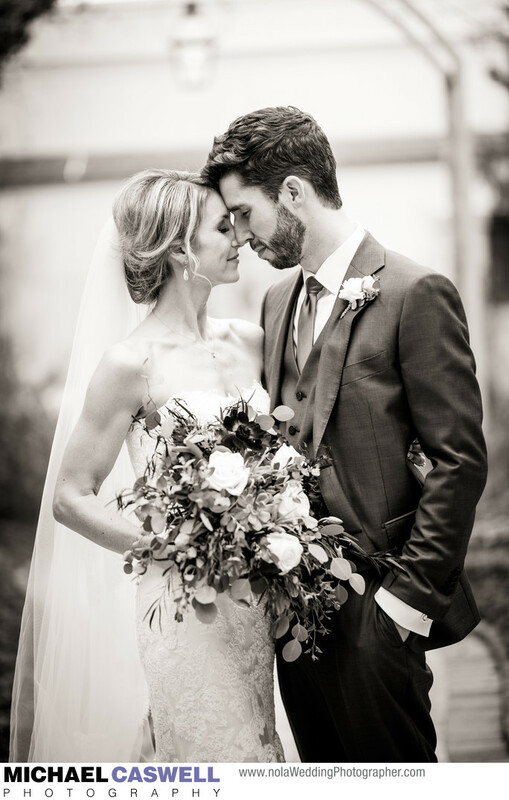 The main photograph featured on this page was captured in what is my favorite way of shooting portraits of the couple when time and the location allow. Rather than precisely directing them as to exactly how they should position themselves, I instead place them in a situation with good light and a pleasing background, and loosely instruct them to simply be themselves. In this case, I had them stroll down this gently winding brick-paved walkway in the hotel's courtyard and pool area, with the main direction given being to not look at the camera but instead just pretend that I was not there. More often than not, magic happens, as it most certainly did in this case! I love the overall look of this picture. The use of a large-aperture telephoto lens creates that attractive background blur that focuses the viewer's attention right to the couple. And we had great light to work with, thanks to the pre-wedding discussions the three of us had about the ideal timing of these portraits. Obviously there's no mistaking that it's a wedding photograph, but the way the couple is strolling along in such a relaxed manner while holding hands and looking happily and lovingly at each other, makes for a much more natural image that connects with the viewer more than an intricately posed shot would. And it serves as a great example of what I love most about photographing weddings, knowing that whenever the couple looks at this picture, it will instantly take them back to this joyous day and remind them of how happy of an occasion it was. Though there are exceptions, these kinds of wonderful portrait images generally don't just happen by accident. 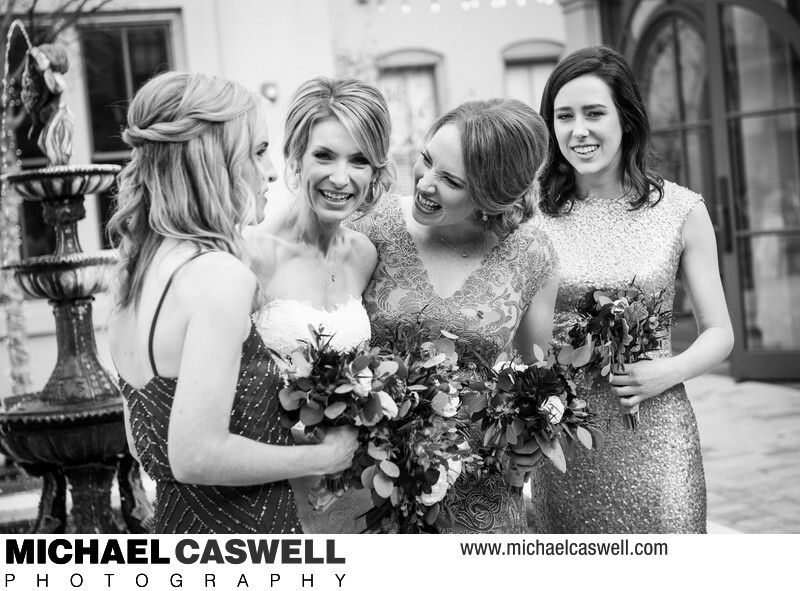 Sometimes an unplanned impromptu portrait outing during the reception will yield similarly memorable photographs, but it's best to give some thought and consideration to this during the planning stages if these kinds of pictures are important to you. I usually like to plan on doing portraits as early into the reception as possible, before the party really kicks into high gear. But because this couple's wedding took place in the early afternoon, I suggested that we instead plan to wait until a bit later to do these pictures, when the light in the courtyard would be better, and with both of them being in the television news industry, they understood this perfectly! Mandeville, Abita Springs, and Covington, Louisiana, located on the northshore not too far from New Orleans, feature several great wedding reception venues, such as The Greystone, Abita Quail Farm, Vintage Court, the Fleur de Lis Event Center, Maison Lafitte, and the Lake House. Location: 428 E Boston St., Covington, LA 70433.